As a General Counsel who has led legal department transformations in three public companies, I can assure you that Bjarne Tellmann’s practical yet sophisticated battle plan has been designed to help General Counsels achieve superior performance in almost any situation. The book is articulate, easy to follow and highly instructive and a road map for new and established General Counsels to create world class premier performing legal departments. Bjarne Tellmann has written a deeply practical book about the challenges facing the modern general counsel. Based on his own extensive experience, the book is filled with insights that both experienced and novice GCs can immediately use to build a world-class legal department. Bjarne Tellmann’s novel approach centres on identifying and managing core legal risk, while building an innovative, connected and future-oriented team. This book is required reading for any CEO who wants to understand what the legal department should be doing. Tellmann’s book will help outside counsel understand the multifaceted roles the GC serves and the types of support needed from their outside counsel. It underscores the critical need for law firms to serve as strategic partners, providing a deep and concentrated level of specialised legal expertise that is tailored to and aligned with business needs. A powerful and practical analysis that illustrates the complex challenges that today’s general counsel face. Bjarne Tellmann’s innovative book provides cutting-edge tools for in-house leaders, while giving law firm and business partners alike a deeper understanding of what excellence looks like for a modern legal department. Building an Outstanding Legal Team is both accessible and actionable. Bjarne Tellmann has written a book that will be immensely useful for general counsel and business leaders alike. Tellmann lays out a path-breaking model that will help general counsel accelerate the performance of their teams at a time of disruption and change. This book is a must-read for both current and aspiring general counsel and the law firms that represent them. It highlights real-world topics that can make or break a GC and provides practical, thoughtful and innovative advice on how to successfully handle them. Bjarne Tellmann has made a significant contribution to the profession as he discusses, with great insight, the multifaceted role of today's general counsel. navigating both types of organisation and maximising the outputs from the firm or the company. Every in-house lawyer must have this essential playbook on his or her desk which combines decades of experience into an incredibly useful and practical read on the role of the modern General Counsel in today’s world. This book is my bible. How is the innovation revolution changing the legal profession? What do successful General Counsel and T-shaped individuals have in common? Why will change management play a critical role in your team’s success? A trailblazer and a recognised change agent in the corporate legal industry, Bjarne Tellmann brings decades of in-house and law firm experience to dissect these and other questions central to building and running outstanding legal teams. His new book is a must-read for any forward-thinking legal industry professional. 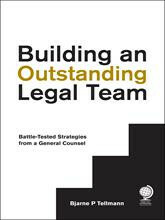 Building an Outstanding Legal Team offers a fresh perspective from the front lines of the in-house counsel revolution. Arising out of Bjarne Tellmann’s deep experience and passion for building effective legal teams, this book is an invaluable resource for anyone involved in the ritical mission of preparing the next generation of corporate counsel leaders. The curriculum of top law schools does well to prepare our graduates for high-level work at private firms, in the government, or in public interest law. Only recently have we begun to focus on the particular organisational, economic and leadership issues faced by general counsel at major institutions. Bjarne Tellmann’s new book is a comprehensive treatment of those issues that in-house lawyer/leaders deal with each week, and as such will be welcome reading for law students, and lawyers of any age or seniority level. Bjarne Tellmann’s powerful book offers invaluable insights on leadership and strategy that resonate beyond the legal department. Building an Outstanding Legal Team vividly illustrates how the General Counsel contributes to the strategic decision-making of modern corporations. Tellmann’s wealth of global experience, combined with his compelling writing style, makes this book a riveting and insightful read for anyone interested in how to be a successful strategic leader. - Thomas C Lawton, Professor of Strategy and International Management, the Open University Business School, Visiting Professor of Business Administration, the Tuck School of Business at Dartmouth and author of Breakout Strategy and Aligning for Advantage. analysis will inform everyone involved in legal leadership. In this practical “how to” guide, Bjarne P Tellmann, General Counsel and Chief Legal Officer of Pearson, draws upon more than 20 years of leading top legal organisations across Europe, Asia and the United States to provide a structured plan for upgrading your legal team in an age of disruption. The challenge: In an era of exponential change, the role of the general counsel (GC) has become one of the most complex, intense and challenging in the corporate world. GCs, must lead, unify and inspire diverse groups of people across the globe with subtlety and diplomacy. The stakes have never been higher and the consequences of getting it wrong can be existential. GCs must react to these challenges with ever-fewer resources and at a time when the legal profession itself is undergoing disruption. The response: To succeed in this “new normal”, GCs must become their own chief executives. They must lead, communicate, inspire, build cultures, manage talent, formulate and execute strategies, ensure efficacy, anticipate and manage risk and manage quality control – all in addition to being top-notch lawyers. This book gives GCs the battle plan they need to get there in three parts. Part I looks at the “hardware”, including how to assess risk, design winning teams, optimise spend, choose the best partners, and select smart technology. Part II focuses on the “software”, including how to nurture a world-class legal culture and develop talent. Part III considers two highly critical threads that weave their way through the transformational journey: change management and the need to develop a strategic roadmap. While primarily aimed at in-house legal leaders, the book will also have broader appeal, as many of the approaches and principles are universal. In particular, law firm partners, lawyers at all levels and leaders from other support functions will find much to draw upon, as will government lawyers, suppliers to the legal industry, such as alternative service providers and technology outfits and consultants. The book will also be of interest to academics and law students teaching and taking courses on in-house legal practice.